ThunderClan is a group of cats that live in a part of the forest that is primarily deciduous woodland. The founding leader, Thunder, got his name from how his mother, Storm, died in a storm of stone and dust, so by extension the name was thought to be given to the Clan. ThunderClan is a mainly peaceful Clan, respectful of the other Clans as well. 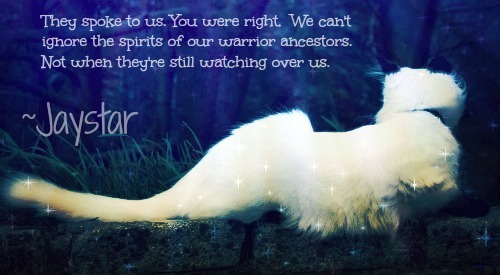 In battle, ThunderClan is fierce, courageous, and loyal. They normally take in loners and kittypets into their Clan to either swell their ranks or because the cat is in need of help or shelter. For this, they are at times looked down upon by other Clans and thought of as weak. The Clan's main prey are mice, voles, squirrels, and the occasional rabbit, as well as birds such as starlings, magpies, wood pigeons, blackbirds, and thrushes. They have excellent stalking techniques, creeping across the forest floor. They have the sense to keep upwind of their prey in the thick bushes. ThunderClan cats are noted to be especially strong. They are the only Clan to bunch their hindquarters before leaping to catch their prey.